Lisa and her husband bike year-round. In the winter months, they typically use fat tire bikes and ride a few times each week. In the summer months, they double the amount of time on the trails. This summer they anticipate trips to South Dakota, Colorado and Duluth to explore new trails. When Lisa was new to the sport, she borrowed her husband’s bike, not entirely sure she wanted to commit to a purchase. When she discovered her husband’s bike was too tall for her frame, and may have contributed to a few accidents, she decided to go for a fitting at Bicycle Sports. She is glad she did and looks forward to using her new bike. Bikes designed for mountain biking are different from regular road bikes in key ways. “They have a longer wheel base for stability, larger tires for traction, and shock absorbers to aid in control and traction. The process of matching a bike to a biker and ensuring a proper fit can be an ongoing process,” says Bob Gritman, owner of Bicycle Sports. One variable to consider when selecting a bike is price, which is, in part, a reflection of the material a bike is made from. While the starting price of some beginner mountain bikes is $400, a good off-road bike with disc brakes and a quality drive train is in the $600 to $700 price range. These prices are for bikes made of aluminum. Bikes made of carbon fiber, engineered to be strong yet lightweight, range from $1,600 to $5,000. Taking a person’s arm and leg length will help determine the appropriate size of bike. Once a purchase is made, the biker goes for a ride and returns for adjustments to make it as comfortable as possible. Trails at Eastwood Park and those at the Gamehaven Reservoir are popular singletrack trails for mountain biking in Rochester. The seven miles of trails at Gamehaven, built in 2013, are designated as beginner trails with no difficult obstacles, but flow through trees and a meadow. The five miles of singletrack at Eastwood Park, which wind through the woods, are designated for intermediate mountain bikers, but have paths for all skill levels. Outside the Rochester area, there are many options for mountain bike enthusiasts. 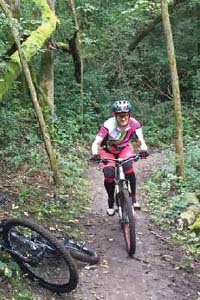 The trails around Holzinger Lodge in Winona offer intermediate bikers nine miles of singletrack studded with steep drop offs. The trails at Lebanon Hills in Eagan, Elm Creek Park in Maple Grove and Memorial Park in Red Wing are rated as some of the best mountain bike trails in Minnesota. More than 400 racers are expected at the Gamehaven Lakeside Grind, July 29 at Gamehaven Scout Reservation. Races for children through adult will take place throughout the day. The Bike Duluth Festival, a familyoriented mountain and road bike event will be held at Spirit Mountain’s Chalet location in Duluth, August 10-12. The Women’s Clinic, a one-day women’s skills camp teaching foundational skills needed for different trail types, is Friday, August 10. Holly Galbus is a Rochester freelance writer.